As communicators, we’re often tasked with managing an organization’s reputation. While this may sound simple, the challenge is where do you start with an intangible concept? There are a number of frameworks around which one can begin measuring reputation. 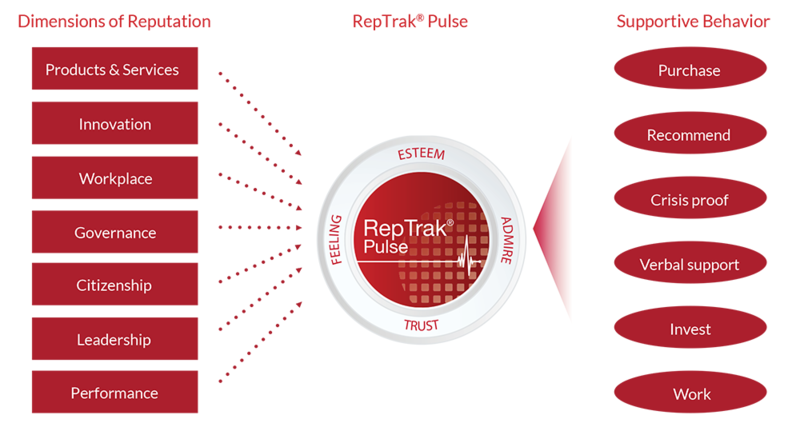 One is the RepTrak, a tool developed by the US-based Reputation Institute, which merges seven distinct organizational behaviours (called dimensions) with the behaviours that your stakeholders show towards your organization to create an emotional pulse. It’s an interesting look at how reputation is developed, which you can see below. According to the Reputation Institute, organizational reputation is driven primarily by seven key rational dimensions of reputation: products and services, innovation, workplace, governance, citizenship, leadership, and performance. What this leads onto may be obvious; reputation matters in terms of business. And, the better the reputation, the more support an organization can count on. Th Reputation Institute has also done a great deal of research here, including surveying hundred of thousands of different stakeholder groups in 40+ countries over a decade. Their studies underline why reputation matters when it comes to influencing stakeholder behaviour. While I have questions around these seven dimensions (do they remain constant for example, across geographies and stakeholder groups? ), as well as the Reputation Institute’s global reach (it doesn’t monitor in the MENA region for example), it’s good to see one scientific model for measuring reputation and its impact. There are others in use, including those developed by Carma’s Tom Vesey. I’ll share more insights into reputation management and measurement as I have it.